What’s the Best Mattress for Obese People After 2015? Buying a mattress can be a complicated, drawn-out process. But when you’re overweight, it becomes even more of a challenge to find the right mattress for your home. Not only do you have to consider the comfort level, but you also have to think about airflow and consider how much weight the mattress can hold. Available in 12 different sizes! Weight Capacity: Some – not all – mattresses will list their maximum combined weight capacity, so it’s important to check for this. Most mattresses can support a large amount of weight, so this should not be an issue for most buyers. Nonetheless, it’s still something that should be considered. Mattress Quality: Poorly made mattresses have issues with sagging under normal circumstances. Overweight sleepers will naturally put excess strain on the mattress, so it’s even more important to choose a high quality model that will maintain its shape for several years to come. Memory foam is an excellent choice for this reason, but you still need to ensure that it’s built with quality foam. Mattress Type: At one time, spring mattresses were the only real option available to consumers. Now, you’ll find memory foam mattresses, pillow-top models, and even mattresses that have a mix of both memory foam and springs. Determine what type of mattress you prefer. This will help narrow down your choices considerably. We’ve spent a great deal of time researching and comparing mattresses to help you find one that suits your needs. These mattresses are ideal for heavy uses, built with high quality materials and supported by positive reviews. 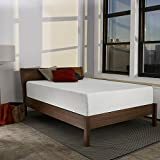 Classic Brands 12” Cool Gel Memory Foam Mattress – The 12” cool gel memory foam mattress from Classic Brands keeps you cool at night while providing you with the support and comfort you desire. Traditional memory foam is poorly ventilated, which can lead to hot, uncomfortable nights. But memory foam infused with cooling gel offers better airflow, which means you stay cooler and comfortable throughout the night. The layer of gel memory foam is sandwiched between two foam layers with HD gel support and a support base. These layers work together to draw heat away from your body, which keeps you cooler while you sleep at night. The foam is Certi-PUR-US certified, and the mattress comes with a stretchy knit cover that maximizes the foam’s contouring properties. Overweight sleepers often have difficulty staying cool at night, so this Classic Brands mattress is an excellent choice if you overheat at night. Brentwood Home Bamboo Gel Mattress – Available in both conventional and split sizes, the Brentwood Home gel mattress is a great choice if you have an odd-sized bed. And with five layers of foam, this mattress is luxurious. Staying cool is often a problem for heavy people, which is why a gel-infused memory foam mattress is a great option. Not only does this mattress have a 3.5” layer of gel memory foam, but it also has a 2” layer of supportive ventilated foam and a 7.5” therapeutic base. Above the gel memory foam layer is a layer of wool and a bamboo cover. The wool further helps regulate your body temperature, while the bamboo offers a hypoallergenic, antimicrobial sleeping surface. If you have a larger budget and want a memory foam mattress that will keep you cool, this bamboo gel mattress is highly recommended. Sleep Innovations Shiloh 12” Memory Foam Mattress – With a medium firmness, Sleep Innovations says its Shiloh mattress is ideal for all sleepers, including those who are on the heavy side. The Shiloh is built with a DuoComfort Design, which features a 2.5” top layer of SureTemp memory foam and a 9.5” supportive layer of support-plus foam. These two layers come together to create a supportive mattress that keeps your spine, hips and neck aligned properly throughout the night. Its design is also proven to alleviate pressure points, so you don’t find yourself tossing and turning all night long. If you’re overweight, you’ll appreciate the pressure point relief, but you’ll also love that this mattress keeps you cool while ensuring that you’re properly aligned all night long. Signature Sleep Memoir 12” Memory Foam Mattress – The Signature Sleep Memoir is both affordable and exceptionally comfortable. It doesn’t come with a protective cover or a layer of gel-infused foam, but it does come in multiple sizes and offers exceptional comfort. The Memoir has two layers: a 3.5” layer of standard memory foam and an 8.5” layer of high density foam. High density foam contours to your body’s natural shape while allowing for optimal airflow while you sleep. The great thing about this foam is that it offers low VOC emissions, so it won’t have a negative impact on your indoor air quality. It’s also made with CertiPUR-US certified foam, so you can rest assured that it’s of the highest quality. Zinus Memory Foam 12” Green Tea Mattress – The Zinus Memory Foam Green Tea mattress tackles two problems that overweight people face when they sleep: lack of support and poor airflow. Not only does the Green Tea mattress conform to your body, but it keeps it aligned while the high density foam ensures proper airflow. This mattress features four layers: a 3” memory foam layer, 2” comfort foam layer, 3.5” high-density Airflow layer and a 3.5” high-density Airflow supportive base layer. Overweight sleepers will appreciate the support and the improved airflow when sleeping on this mattress. Wondering where the Green Tea part of the name fits in? Zinus infuses the memory foam in this mattress with green tea extract, so it stays fresh. And just so you know – this mattress can support up to 450 pounds of combined weight. The mattresses on our list are all excellent options for overweight people, but which one do you choose? To narrow down your choices, there are a few things you should be on the lookout for. Great Airflow: One of the most important things to consider, especially if you’re looking at memory foam mattresses, is airflow. Heavy people often have issues with overheating at night, which can make sleeping uncomfortable. Conventional memory foam has poor airflow, but high-density or gel-infused memory foam has excellent airflow. They actually draw heat away from the body, so you enjoy a comfortable, cool night of sleep. Size: Naturally, you want to choose a mattress that will fit your bedframe. But size becomes even more important if your bed is a unique size, like what you would find in an RV. It’s also important to remember that some mattresses are thicker than others, which will affect how the mattress fits on your frame. Support: Another important thing to think about is the support the mattress offers. If you’re experiencing chronic pain, a supportive mattress can help alleviate the discomfort by ensuring that your spine, neck and hips are properly aligned. Price: Finally, you need to consider the cost of the mattress. Memory foam tends to be more expensive, but this type of mattress tends to last longer while maintaining its shape. If you’re overweight, these are two important things to think about, so spending a bit more on your mattress may be worth it for you in the long term.